A friend sent me this article by the founder of Squarespace from the current issue of Southwest's magazine. I'm not sure if it was sent to me because I often read the magazine or because it is so fitting. I am guilty of always wanting to define the performance criteria and then establish design criteria. But, what other way is there? Just do what one has always done? Design something without any consideration of the performance needs? Clearly I need to think about this a bit more. The big lesson in the article is that “what made you successful in the past isn't necessarily going to make you successful in the future”. Often that can be difficult to accept, particularly when one enjoys the way things have been. But it's difficult to ignore the wisdom in that statement. Thus, like any organization or business, we need to continue to evolve to meet current needs and wants. That means different programming, in different ways, and to different audiences. While this isn't a bad thing, it is uncomfortable at times. I often think about the TED talk that proposes “life begins at the edge of your comfort zone”. I have a long list of TED talks to watch but that's one I like to go back to every now and then. Because I happened to be on a Southwest flight last week, I flipped through the magazine. 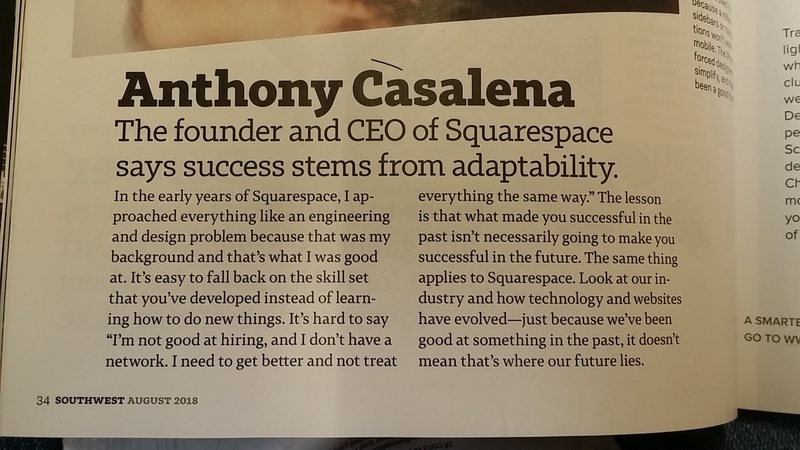 In addition to that article by the CEO of Squarespace, a few other things stood out. First, was a piece about Southwest's commitment to and support of STEM education for youth. Once again, I found myself wondering if the company has a grant or scholarship program available and how the 4-H program might partner with Southwest. The other thing that stood out was a quote that I don't remember exactly but it was to the effect of the following. An early or big win builds complacency. Repeatedly hearing ‘no' leads one to just stop trying. As a result, failure is the only clear path to success. That was true in grad school; I learned a whole lot more through failure than I ever did from getting it right the first time. But I hope the statement doesn't always apply. We are still wrestling with the budget. As a result funds for Program Teams, CE Specialist and AES funds to work with CE Advisors, and program support dollars have not yet been released. It's a challenge to find the funds to cover the shortfall and minimize the impact it has on people while leaving the division in a position to better weather the future. We can't do it without causing pain and discomfort but in this case, failure is not the path to success.